In this essay I look at the war in heaven from five different angles. First, I examine the historical antecedents of the war in heaven, its origins and evolution of the narrative in Western religious traditions. Second, I explore the development of the narrative in Mormon thought and its literal level of interpretation. 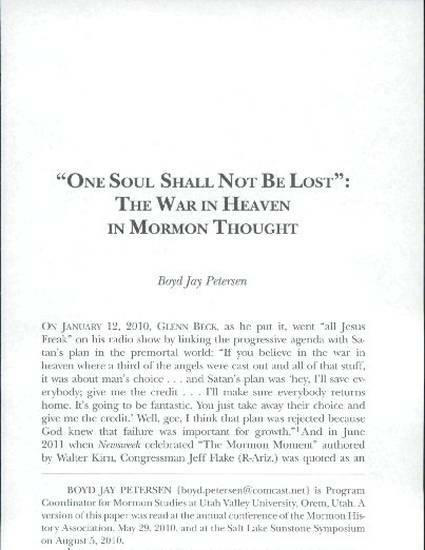 Third, I discuss ways Mormon use the war in heaven to convey a moral message. Fourth, I examine in some detail the ways Mormons employ the narrative as an allegory to explain current events, illustrating the Mormon worldview engaging in increasing conflicts about agency. Finally, I conclude with a brief look at how the narrative is used to portray future prophetic events of Church history.